I bought Sporty’s G1000 checkout course and am watching the DVD now. 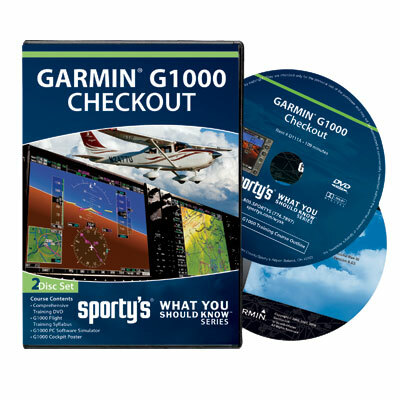 The package includes a video DVD that shows the controls in action and a second disk with a G1000 simulator and training syllabus. The simulator can be installed with several different airframe configuration. I used the C172S since that is what I can rent at Skill Aviation. It will accept control inputs from a joystick and I found it works fine with my CH yoke. Together, the video and sim provide a very good introduction to the G1000. The video presentations, narrated by Rob Reider, are clear and complete in typical Sporty’s style. The simulator lets you push every button and turn every knob to learn what each does. If you supplement this course with Max Trescott’s G1000 book you have a superb training tool. I find that having the simulator open while reading procedure in the book greatly enhances the learning process. Yesterday I booked an hour of CFI Sandy’s time to get a chance for some hands on G1000 practice. We pulled Skill’s G1000 equipped Skyhawk out of the hanger (so we could get a GPS signal) and hooked it up to ground power. We climbed into the airplane and spend about 40 minutes going through every screen on both the PFD and MFD. Very helpful for learning how this aircraft is set up. This training is leading up to a special aviation adventure that I hope to complete soon. I will make a full report when the time comes but, for now, I am withholding the details. Flying glass is a great experience. However some of the ergonomics could stand to be improved. I just finished reading “Glass Cockpit Flying” by Littlefield. You might find it interesting. “Glass Cockpit Flying” looks like a good book. I am adding it to my reading list. Thanks. I did the same thing coupling the Sporty’s DVD with the Max Trescott book. Look forward to hearing about the special aviation adventure. The report is coming very soon Todd!